Maintaining moisture in your skin is the ultimate way to keep your skin looking youthful. Hydration is everything. The Koreans, long known for their beautiful skin, have known this for generations. We are just catching up. While there are many steps, it only adds a couple of minutes to your skin care routine and the reward of supply, hydrated, plump skin is worth it! The most important difference is the addition of a toner and the number of moisturizing and hydrating steps you will take each day. Instead of your basis cleanse-hydrate routine, you will add several additional hydrating steps. Below is a guide to your new beauty routine incorporating the Korean proven practices for youthful, hydrated skin. You can use whatever brand of products you love! Foaming or Gel Cleanser: No need to do a double cleanse in the morning. Just one good wash with your preferred foaming or gel cleanser to prep your skin for the hydration coming it’s way. Toner: Toner is a must as it absorbs into your skin faster than moisturizers and it preps your skin to absorb the rest of your products more efficiently. Eye Cream: Pat your favorite eye cream around each of your eyes by following the circular bone area above and below. Serum: Serums such as vitamin C, antioxidants and peptides are next. You can use all or choose just one. Moisturizer: Apply your daily moisturizer to seal in the products above. SPF: Apply a layer of SPF rain or shine to protect your skin. Oil or Cream Cleanse: The first cleanse done with oil or cream, removes the spf and anything sitting on top of your skin. Foaming or Gel Cleanser: The second cleanse washes away everything else that is remaining on the skin. This will provide a clean pallet and allow your skin to soak up the toner. Eye Cream: Same as above. Twice a week take the time to exfoliate your skin with a gentle scrub or enzyme and apply a mask. Do these add ons after you cleanse, before your tone, and finish with additional hydrating steps in the evening to get that glow from within! Now that is taking your skincare to another level! Be Extra when it comes to taking care of your skin. Its a form a self-love and thats a practice we should all be better at! As we continue to celebrate a month recognizing women in history, we want to do a little something special! Along the way we have been influenced by many of you strong women reminding us we can dream and succeed. This package is valued at $450! Share our mission to spread the love and good luck to all of our nominees! 5 Tips to Clear, Radiant, and Glowing Skin! March 8, 2017 / Krista Spence / Comments Off on 5 Tips to Clear, Radiant, and Glowing Skin! 5 Tips to maintain Clear, Radiant, and Glowing Skin! Cleansing is the first step to clear skin. Every skin type should cleanse morning and night so, no more quickies! In addition, you should be washing your skin for a minimum of TWO MINUTES!! Start simple by adding in a solid cleanse to your routine to make it a habit. Cleansing at night is most important, especially those with oily or combination skin. Consistency is key here so just make the commitment and enjoy the benefits! NO PICKING!! This is actually the worst thing you can do. If you are acne prone, keep your hands off! Bacteria, viruses, and allergens are transferred from your fingertips to your skin with just one touch. This common habit can lead to to spreading bacteria to cause break outs and even scarring. Water keeps your skin looking good… period! When you’re dehydrated, your skin shrivels up causing scars to appear darker and more raised. Fine lines and wrinkles are also more visible. Overall your skin feels and looks lifeless and dull without H2O! Pillow cases collect all kinds of filth that can clog your pores. Conditioner residue, natural scalp oils, and expired makeup are a few things that are eft behind on your pillow case which eventually transfer to your face! Its best to change out your pillowcase at least once a week. Make up brushes are a breeding ground for bacteria! Clean your brushes at least once a month with a gentle cleanser or baby shampoo. Wet the bristles of the brush letting the water absorb into the fibers. Put cleanser in the palm of your hand and gently swirl the brush in while rinsing and repeating until water runs clear. Blot the brushes on a clean towel, then use a blow dryer to finish drying the bristles or lay flat dry overnight. It is so important to be mindful with any interactions when it comes to your skin because bacteria is essentially everywhere. Making these steps a habit will only benefit you in trying to achieve clean, fresh and radiant skin! Hope you enjoyed this post, like and/or share if you think it was helpful! March 8, 2017 / Krista Spence / Comments Off on What Skin Type Are You? It’s important to know your skin… Understanding your skin type will help determine a regime suitable for your needs and desired results. It is also crucial when choosing products for both basic and intensive treatments. Dry- Skin does not produce enough oil and may feel dehydrated. Dry patches and flakiness. Usually feels tight & uncomfortable after washing. Dryness can cause sensitivity to the skin. Normal- Skin is well balanced, has a smooth texture and small pores. Combo- Combo skin is the most common. T-zone is oily or shiny by mid-day. Dry areas on the cheeks, intermittent blackheads, and fine lines among drier areas. Oily-Skin appears shiny by mid day, large pore size and thicker texture, may have blackheads and be prone to occasional breakouts. &/or/sometimes Sensitive- Skin tends to be red, blotchy, uncomfortable, or have a thin texture. Hyper-active to external and internal factors, more prone to premature aging. This can come and go, depending on the health of your skin or can be genetically inherited. Your skin type doesn’t change whereas your skin conditions are consistently changing. There are many factors that affect skin conditions such as; genetics, weather, emotions, hormones, and stress. I recommend to consult an esthetician to perform a skin analysis to determine your skin condition. Persistent flushing, skin often feels irritated. Environmental or topical triggers may increase symptoms. Dehydrated areas are present. Visible redness and/or capillaries are present. What’s your skin type? I would love to offer you a complimentary online consultation so comment below or email me with what you have determined here and we can get started! Microdermabrasion & Chemical Peels are professional services that work to resurface the outer layer of the epidermis, the layer you can actually see. Microdermabrasion is a mechanical exfoliation and Chemical Peels are a chemical exfoliation. 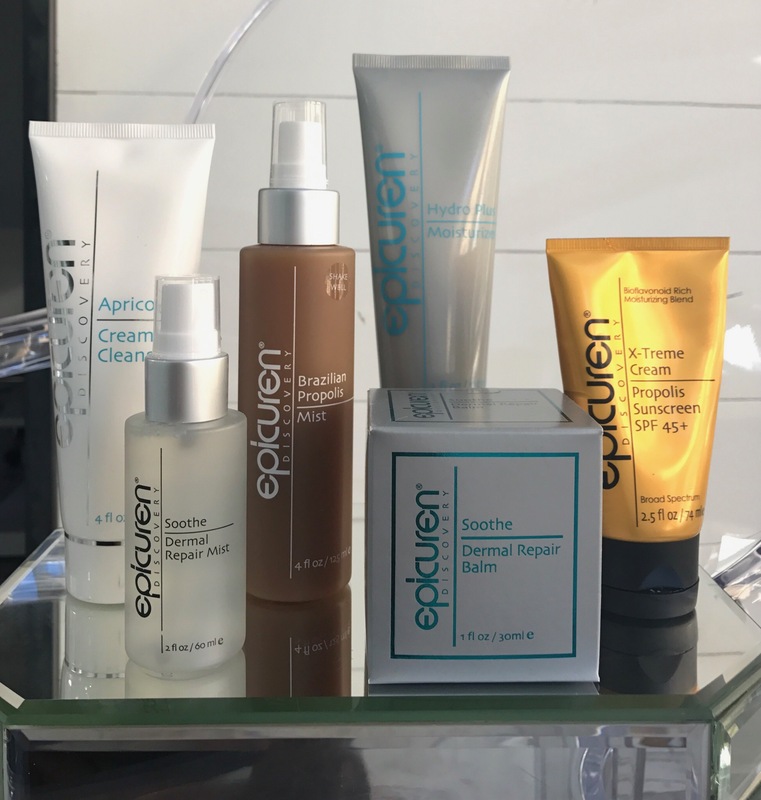 Utilizing these services separately or in conjunction will help brighten and soften your skin while increasing skin cell turnover. This can be an aggressive combination of services so make sure you know the quality of the products and esthetician before having this treatment done. I have designed a 6 week series of micro and chemical peels for clients who are looking to treat hyper-pigmentation. Below is an example of a client I treated with 6 treatments over 8 weeks. I gradually increased the intensity of the micro and the percentage of the chemical peels to build progression. To maximize results I had her use a gentle & nourishing home care kit. After her 8 weeks of treatments with me and her consistently using the recommend products at home, we were blown away with the improvements. You can see how her darker spots drastically lightened and there is even a smoother, brighter texture to her skin. Stay away from UV exposure. Do not wax or have any type of hair removal before (if so, make sure your esthetician knows to apply a barrier over waxed areas). Stop using medications such as Retin-A, Tazorac, Renova, Accutane, Differin, Avage, or any high percentage glycolic acid products 1 week prior to peel. Stop use of any exfoliating products 1 week prior. If pregnant, lactating, or think you may be pregnant, always consult doctor prior to receiving professional treatments. Use recommened home care products to properly prepare your skin. Avoid all waxing hair removal procedures. SPF! Apply Sun Protection with a minimum of SPF 15, every 2 hours if outdoors. Avoid all forms of direct UV rays and excessive heat for at least 2 weeks. Apply Sun Protection with a minimum of SPF 15 every 2 hours if outdoors. Do not use a tanning bed for at least 3 weeks. Discontinue use of topical retinoids prescribed by a doctor. Do not have any form of Micro, chemical peel, or laser treatment for a minimum of 14 days. Do not have injectables, waxing, electrolysis, and/or use of depilatories for a minimum of 2-5 days post service. Allow the skin to rest and normalize overnight. If necessary, you may apply make up after. Wait at least 30 minutes after your treatment. If the skin begins to peel or flake, do not pull or pick at the skin as this may cause trauma or hyper pigmentation. Do not exercise and avoid excessive heat (baths, showers, hot tubs, steam rooms, and saunas). Stay out of the sun, wear hats, protect your skin and reapply SPF every 2 hours if outdoors. As intense as this series may sound, it truly delivers amazing results. Microdermabrasion and Chemical peels can be added to any of my facial services for additional benefits such as anti aging, firming, and detoxifying. If this is something you are interested in learning more about, please Comment below or contact me at info@kristaspence.com! Hyper-pigmentation: The major cause of hyper-pigmentation is external UV exposure causing sun damage. Unprotected skin can result in age spots and or darken exisiting hyper-pigmented areas. Internal hyper-pigmentation can be caused by pregnancy, various medications and acne. During pregnancy hormones can trigger overproduction of melanin that causes a “pregnancy mask”. Women who take birth control may also develop hyper-pigmentation as the body experiences similar hormonal change as when pregnant. Other factors can be a result from outside causes. Acne for instance, can leave you with light scarring that may darken existing breakouts. Acne: Acne is a chronic disease. Internal factors of acne can be caused by stress, fluctuating hormones and genetics. Sweat glands also release toxins in the body that can also make you break out depending on the sensitivity of your skin. Acne can also be by a Zinc and Vitamin A deficiency. External factors come from bacteria and environment. An overproduction in the sebaceous glands (oil) and a buildup of dead skin cells that clog the pores and create congestion (blackheads). The congested areas have a rough texture and dull/grey appearance. If the congested areas get infected with bacteria, it can spread and create pustules (white heads). When treating acne it is important to find the right moisturizer. If your skin gets too dry, your skin starts to produce excess oil that can get trapped in the skin from a lack of exfoliation and hydration which causes inflammation. Anti Aging/ Basic Maintenance: There are two distinct types of aging; internal which is genetic and external which is caused by environmental factors such as the sun. A majority of collagen loss in your face can be from UV sun damage. The appearance of wrinkles and discoloration can appear and make skin seem less radiant. Around the age of 25 collagen and elastin start to break down. Skin can be more dry causing lines and wrinkles to appear more prominent. As we age, gravity takes its toll so the need for hydration, productive circulation and collagen is key. In Addition… Free Radicals are caused internally and externally. Free radicals are responsible for the visible and invisible signs of aging. Free radicals are caused externally by environmental factors like UV rays, radiation, cigarette smoke, automobile exhaust, and pesticides. Internal causes consist of not getting enough rest, excess stress, or not maintaining a healthy diet. Free radicals can damage the DNA of your skin cells destroying the collagen and elastin in your skin. Wrinkles, dryness, and sensitivity are all jeopardized by free radicals. To maintain vibrant, glowing skin you must take good care of yourself so SPF should be applied daily and seeking treatments are a must! Offering solutions is very important to me and my mission as an esthetician. I take my time understanding concerns and personalizing a plan to treat them. I offer complimentary consultations to anyone seeking advice so you are welcome to comment with questions below or email me personally for a one on one (info@kristaspence.com) … I am excited to help! March 8, 2017 / Krista Spence / Comments Off on Hello 2017! With the new year underway, we are all making new commitments in both health and fitness. Eating better, juicing, new workout routines, more yoga, taking time for ourselves, getting more sleep… You name it we are ready for it! But what about skincare? What about understanding more about what is causing signs of aging, hyperpigmentation or acne? Just as we commit to new health and fitness goals, we forget to make skincare a lifestyle change as well. Don’t get me wrong, you will see major positive changes in your skin when you are making more mindful health and fitness choices, but the work you are doing inside only makes up half of what is truly obtainable. Do you go to the gym for one hour one time and see results? Can you feel a consistent energy boost just from one green juice? It takes patience and dedication to see the results we want no matter what we are working towards. I’ve trained, studied, and researched skin over the last 10 years and I am excited to share everything I can to help you understand it all as well. I am making a commitment to you this year, so we can personalize and achieve healthy skin goals that help you look and feel your best! Join me here on my Blog and on Instagram @xo.kristaspence where I will be sharing posts to influence healthy skin. I will also include questions I receive with detailed responses that could benefit other readers, so share your curiosity with me and I will address solutions! Happy 2017 and congratulations on making healthy choices inside and out!